Tourism and Entertainment Minister, Hon. Dr. Wykeham McNeill, says the 129-room Courtyard by Marriott Hotel, in New Kingston, will assist in satisfying the demand for more rooms in Kingston. More than US$25 million has been invested in the building’s construction, which took two years. The first Leadership in Energy and Environmental Design-certified (LEED) building in Jamaica, it also has an interactive board known as a Goboard that serves as the Hotel’s concierge. “Over the last two years, in particular, this demand has grown and people have been crying out for more rooms. This is a great addition to what we offer in Kingston,” the Minister said, during a tour of the facility on November 30, a day before its opening. “We have had some new properties and some expanded properties. Spanish Court Hotel was transformed from a shopping plaza and we’ve had expansions to other properties and we’ve had renovations. I think this property is a newly built one in two or three decades, in Kingston,” the Minister added. Dr. McNeill said the hotel’s opening is timely and is a strong addition to Kingston, to the business traveller and to those persons who are coming specifically from the United States. “This will go a long way in where we want to position Kingston as the cultural capital of the Caribbean,” he emphasised. The third hotel of its kind under the Courtyard by Marriott brand to be developed in the English-speaking Caribbean, it boasts more than 1,900 square feet of meeting room space. Most of the furniture in the hotel has been sourced locally, representing the management’s commitment to the local small and medium-sized enterprises. “In terms of employment, we have employed 70 persons, most of whom are Jamaicans,” said the hotel’s General Manager, Koen Hietbrink. 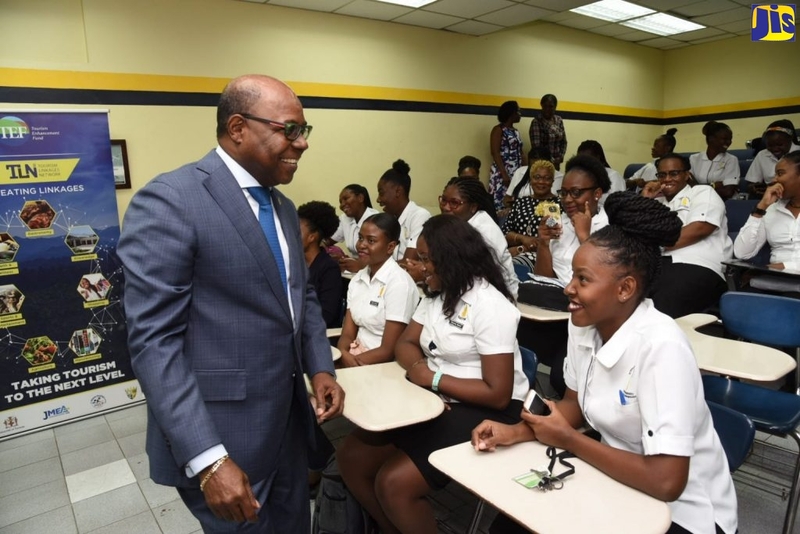 The management of the hotel has ensured that at least five of the employed Jamaicans are recruited from the Citizen Security and Justice Programme (CSJP). “Our shared-value component for the youth-at-risk programme was very important to us,” Mr. Hietbrink said. The employment of other at-risk youth was also done during the construction phase. Mr. Hietbrink told JIS News that approximately 98 per cent of the hotel has already been booked.